Your business interests include your shareholders, stakeholders and community. Build your relationships with all of your interests by offering incentives and rewards to encourage growth and new business. The Traffic Ticket system is an interactive promotional tool that increases foot traffic. A business will distribute Traffic Tickets, normally via regular mail or physical handouts at events, to prospects, leads or customers. Recipient brings their ticket to a pre-arranged location and scans it using a branded Reader Board. The electronic board automatically lights up to reveal which one of the five prizes the recipient has won. Everyone's a winner with the Traffic Ticket system. All participants win one of five prizes when they scan their tickets, creating a positive touch point with your target audience. 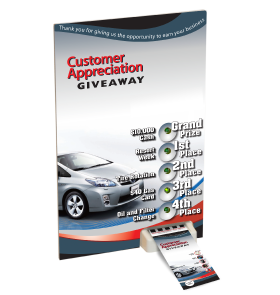 It's an interactive way to increase brand awareness and foot traffic. Our marketing team will help you devise a strategic program that supports your business goals, from choosing approrpiate incentives to developing a plan to reach additional customers. From outstanding content to incredible graphics, our top-flight design team will help you create a custom Reader Board, Traffic Tickets and supporting collateral. We are a full-service travel agency, and are prepared to fulfill any lifestyle and travel incentives you use as prizes. Our seasoned travel agents will make sure all your customers feel like winners..
Perhaps your business has tried a flat mailer or scratch-off promotion in the past with limited success, requiring you to send multiple mailings or try additional tactics. In contrast, our clients have discovered that a Traffic Ticket program only requires one mailing or distribution for a high response rate. Your business wins by signing up new customers, improving loyalty or increasing sales, depending upon your program's goals. These certificates entitle the recipient to airline discounts - on flights to all 50 United States, Canada, Mexico, the Caribbean and certain international destinations. Airfare between $200 and $299 receives a $25 discount. Airfare between $300 and $399 receives a $50 discount. Airfare between $400 and $499 receives a $75 discount. Airfare of $500 or more receives a $100 discount. This certificate can be used until the recipient has accumulated discounts totaling the value of the certificates. Imagine taking that dream vacation and having the added extra luxury of a studio, 1-Bedroom or 2-Bedroom unit to enjoy. That vacation just got upgraded! Plus, a full week at the destination of choice provides the recipient with the chance to really enjoy their trip. The locations that the recipient can enjoy are in some of the nicest resorts in some of the best locations across the world. No cRowded hotel rooms, and no required tours or sales pitches. This resort vacation is just what you've been dreaming of.